The Salzburg-based ensemble for early music and music on authentic instruments “Salzburger Hofmusik” received a new Website made by missionCulture. The Hofmusik was founded by Wolfgang Brunner and forms an ensemble in variants from trio to orchestra. The programmes focus on the Salzburgian court music traditions leading to Wolfgang Amadeus Mozart and his contemporaries. The musicians are playing mainly, but not exclusively on contemporary instruments. The Salzburger Hofmusik was invited to festivals from Brugge to Istanbul, more than 50 CD’s have been recorded. 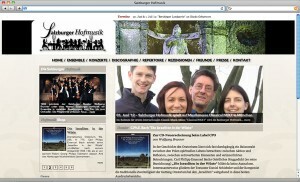 MissionCulture also supports the Hofmusik with artist management.